Mr. H. Bouchard, a famous sculptor in France, was familiar with Dr. H. Tisser. While in life, he made a copperplate of Dr. Tissier’s portrait and left it to his son , Dr. F. Bouchard. Dr. F. Bouchard, loved by Dr. H. Tissier in his childhood,later become a scholar in a field of cardiology. Under the influence of his father ,he was also much interested in the art of sculpture. In 1987, Dr. N. Homma, the president of Japan Bifidus Foundation, visited France and by chance met with Dr. F. Bouchard, and knew the relationship between Dr. H. Tissier and the Bouchards. 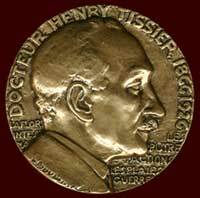 Then, it occurred in his mind to reproduce the medal sculptured Dr. Tissier’s portrait as the treasure of the Foundation. At Dr. Homma’s request, Dr. F. Bouchard reproduced the medal by the end of 1987. In order to express the respect to Dr. Tissier’s discovery of Bifidobacteria (1899) and his foresight of indicating its importance, and also to with his great achievements to be useful for the progression in welfare of human beings, the Foundation has honored the people who have contributed to the research development in this field with the Tissier-medals every year since 1988.